When it comes to classic fashion, the Velvet Collar Chesterfield overcoat has been a longtime favorite style of men who prefer to dress with style. The black velvet collar on this top coat makes it a Chesterfield which is a vintage style from the 1920s. It's the type of coat you would see men on "The Boardwalk Empire" wearing. 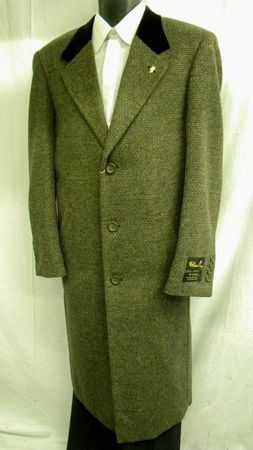 This brown tweed Chesterfield overcoat by Falcone features a single breasted 3 button style with a center vent and should be ordered in your exact suit size for best fit. Fabric is a Cashmere feel Wool Blend. When overcoat season hits, it's time to show the world what you're made of. Style. Take it up a couple notches in this rich looking brown tweed Chesterfield overcoat made by Falcone. With a black velvet collar and all the style you'll ever wish for.